Have you ever wondered what was happening in the world on the day you were born? Well help is at hand with this brilliant gift idea. Newspapers are available from every day within the last 100 years that have been carefully stored and protected to reach you in perfect condition. For £39 (expensive but worth it!) you can grab yourself a real newspaper from your date of birth. I think that is an incredible price considering it had been preserved for 21 years in most readers of this blogs cases. It would make a brilliant and very memorable cherishable gift for family, loved ones and friends. 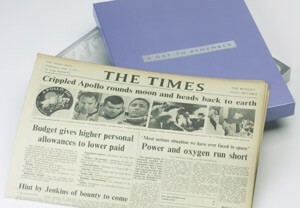 Grab a newspaper from your date of birth from our special 21st birthday gifts section now!